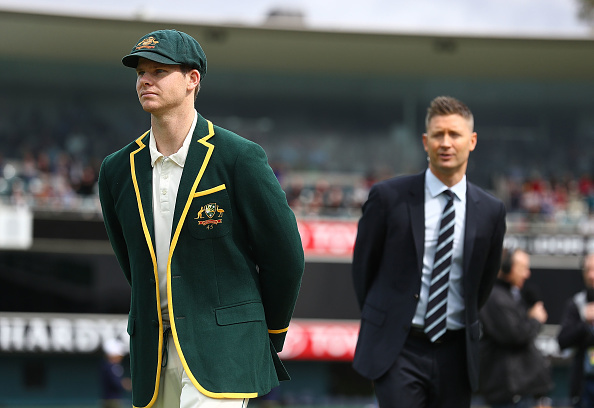 Former Australian skipper Michael Clarke has offered assistance to his successor Steve Smith in the wake of their series defeat to the Proteas. Clarke has called on Smith to ‘take ownership’ of his Test team in order to bring a halt to their rapid slide, and Clarke has offered his wisdom to help him get through it. The 35-year-old, who played 115 Tests for the Baggy Greens, retired after Australia’s 3-2 defeat in the Ashes last year, their fourth straight away Ashes defeat. Smith took the reins after that and he got them back to the top of the pile following a series win in New Zealand, but five defeats in a row has seen them slip to third, and they’ll sink to fifth if they lose the third Test in Adelaide. Smith’s form on a personal level is brilliant. He’s the No 1 batsman in the world with 15 centuries from just 45 Tests with an average of 57.69. His role as a captain however, is coming under intense scrutiny. ‘Smith’s performances as a player are unbelievable,’ said Clarke. ‘He’s leading the way as a player. But this is where he’s going to be tested as a captain … in how he turns this around from how poorly we’ve been playing for the last five Test matches to getting back to where Australian cricket needs to be. ‘I think now Steve Smith has to take ownership of this team. ‘I want the Australian team to know that we are right here to help them. We are a part of that cricket family,’ Clarke continued. ‘Our phone numbers haven’t changed. We’re at every single game. ‘We don’t want to get in anybody’s way, but if the Australian changeroom feels like they can use our services for anything to help them, we’d love to help.